Day 1: Getting off to a great start despite getting stuck in the mud! We have arrived back in Kenya ready for another adventure and productive 10 days with our sister clinics here as well as a new addition, a clinic in southwestern Uganda close to the Congo border. It will be interesting to say the least! Given our desire to visit all three clinics (set in two different countries!) we will need to cut short the duration in each and divide and conquer. 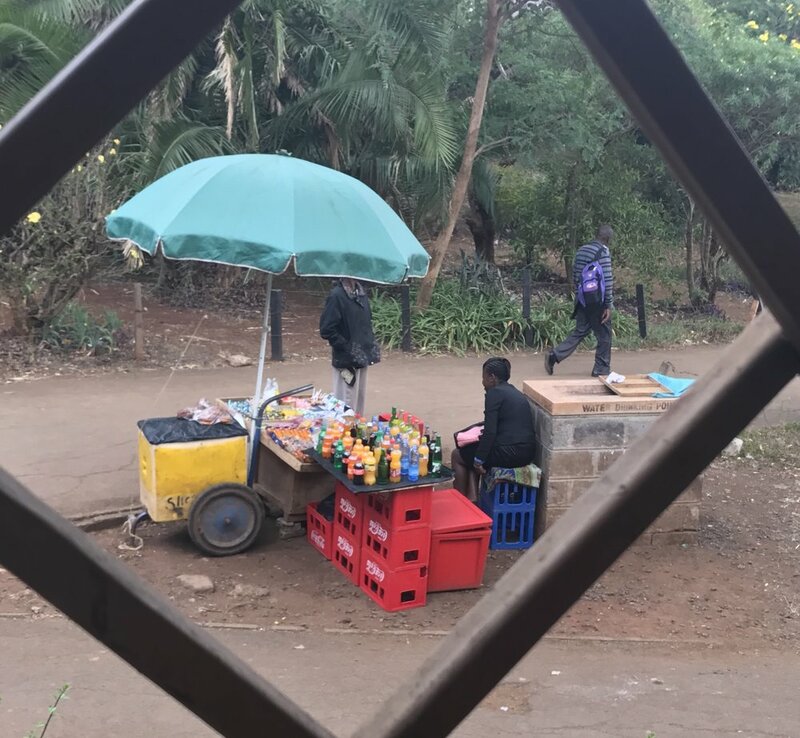 After a fantastic day and a half at the Serena Hotel in Nairobi where the team had a chance to discuss the week ahead, half of the team headed to Fluorspar Mines and the other half to Lewa Downs Conservancy. A food kiosk outside the Serena Hotel. Dr. Michael, Jen and myself headed to Fluorspar on our 50 minute charter flight down into the Kerio Valley. We were told that the airstrip on which we were landing was potentially too muddy for landing, but they were “hopeful all would be ok." So we boarded with a bit of trepidation and we bumped along to Fluorspar in the hot humid air. I’m happy to say we landed with no issue however as the plane made its turn the front wheel became stuck in the mud. Luckily there was the usual welcoming crowd of neighbours, school kids and thankfully this time, about 20 young men who are part of the National Youth Service. Their school just happens to be next to the airstrip and for fun they will come to watch the planes land and take-off. They were kind enough to help the pilot and co-pilot push the airplane out of the mud (apparently the plane is “really light”) while we watched from our vehicle. After the plane was freed from the mud, the pilot repaid the good samaritans by allowing them to climb onto the plane to take each other’s photos, resulting in lots of smiles and laughs. The NYS students helping push the plane out of the mud. After lunch we met with a member of Fluorspar’s management team to discuss the future at the mine. As you may remember, Fluorspar was forced to close the mine just before our last trip in July due to a new entrant in the market who is able to produce a high quality fluorspar at competitive prices. This has been devastating to the community as Fluorspar Mines is basically the sole employer in the valley. Without it, the people literally have minimal to no employment options. Most have refused to move and are remaining in their homes praying that the competitive climate will improve and the mine will reopen. Given the cyclical nature of the mining industry, the people are optimistic that things will pick up and the mine will resume operations. The question is: when. The clinic’s operations are funded by the mine and with its closure the future of the clinic is uncertain. For now the mine has decided to keep the clinic open and it seems business as usual, albeit a bit slower. We then headed to the clinic and met with Julius, the clinic manager, and Noah, one of the clinical officers. We discussed the morale of the clinic staff and community. He said that despite the obvious stress that everyone is under, people are doing okay. They are a tough and resilient community and they very much appreciate the generous spirit of the owner of Fluorspar Mines who has agreed to fund the clinic and the school for the time being. Jen and Dr. Michael auditing the Chronic Disease data and ensuring the patients who have been identified as at risk are being followed up properly. We were happy to find that the Chronic Disease Program which we have begun here at the mine is doing very well. The three Community Health Workers we’ve hired have screened over 3,000 people over the age of 40 for cardiovascular disease (CVD) risk utilizing an SMS technology which measures 5 data points of each patient. We are proud to say that Naweza is the first to utilize this WHO CVD risk protocol in a novel mHealth tool, which empowers community health workers to screen for chronic disease in their communities. Apparently a rooster decided to "write" an email by pecking on this keyboard and in doing so damaged the keys. The computer was provided by Naweza to help manage the Chronic Disease program. Our next step, which we are currently in the process of developing, is to build an EMR (Electronic Medical Record). This EMR will enable the clinicans to follow-up with the patients ensuring that they are adhering to their treatment strategies, thus resulting in better health outcomes. We will then leave on an afternoon charter flight to Lewa Downs Conservancy where we will meet up with the other half of our team. We look forward to an update from them on how their first day went with the Lewa team.